In the past couple of months, I have seen and written about a number of entrepreneurs who have developed and branded special and innovative products and services. Many of these products are locally inspired, high quality and target a very specific consumer segment. These brands tend to be small but they create a unique and personal customer experience. Their goal is not to be all things to all people. They leverage the heritage of a region and engage consumers on an emotional level. Their founders usually have a great story and are passionate about their business. In a world dominated by mega brands this is a refreshing trend. I recently became aware of the Albany Distilling Company which was launched in October 2012. Albany Distilling is making the city’s first licensed whiskey since Prohibition ended in 1933. 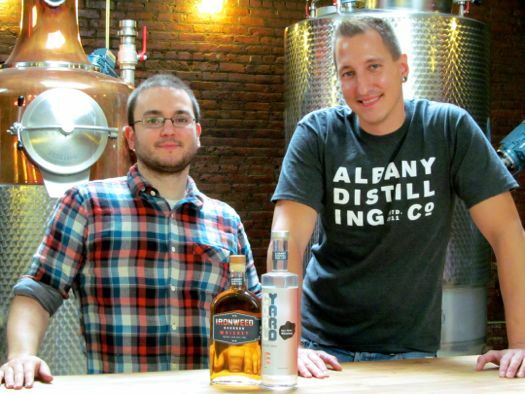 Albany Distilling was founded by Matt Jager and John Curtin. Albany Distilling opened in what was once the coal yard of the Albany Pump Station, a facility that was once used to pump water from the Hudson River to the Bleecker Reservoir. Their original plan was to open a bar but they were unable to obtain financing. Since both Jager and Curtin liked whiskey, they launched a plan to open a distillery. They visited other distilleries to learn about the operation and sample the product. They liked rye products and developed a commitment to use locally sourced ingredients. With the creation of the New York State’s Farm Distillery License, distillers who use New York State crops have a much easier time opening a distillery and self-distributing their craft products. Imagine the State of New York actually helping business development. Albany Distilling has developed a number of products that celebrate Albany’s unique heritage. These products include “Ironweed Whiskey”, “Coal Yard New Make Whiskey” and “Quackenbush Still House Rum”. John and Matthew also understood the importance of building a unique brand identity that would connect with consumers. They partnered with ID29 an innovative and creative Troy, New York based Brand and Communication Design Studio to develop their brand identity, logo, packaging and website. Albany Distilling has come to market with three key elements a unique creation story, great product and an appealing brand identity. Albany Distilling is located at 78 Montgomery Street in downtown Albany. Please let me know of any other small upstart locally inspired brands that I should write about.